The zebra crossing on Chesterton Road between Carlyle Road and the Jesus Lock footbridge has been an accident blackspot, however following the installation of fantastic quality floodlighting and orange LED halos around the belisha beacons (Zebrite Belisha Beacons ) the number of incidents appears to have been falling. From what I can glean from the County Council’s website there have been only four recorded accidents causing injuries in 2006 – 2008 (1), compared with seventeen in 2004-6 (2). The improvements were made in mid-2007. Despite the fact that properly lighting the crossing clearly reduces injuries Cambridgeshire County Council appear unable to keep the floodlights, belisha beacons, and adjacent streetlights working. I have reported various combinations of lights in the immediate area of the crossing being either out or flickering many times in the last six months or so. I have typically made the reports by phone to the answerphone service on 0800 253529 as I pass through the area in the dark. The problems I reported have not yet been fixed. One of the main floodlights is intermittently flickering between on and almost off. Even in the above photo, a streetlight to the left of the photograph is out (the bottom of the pole can be seen). 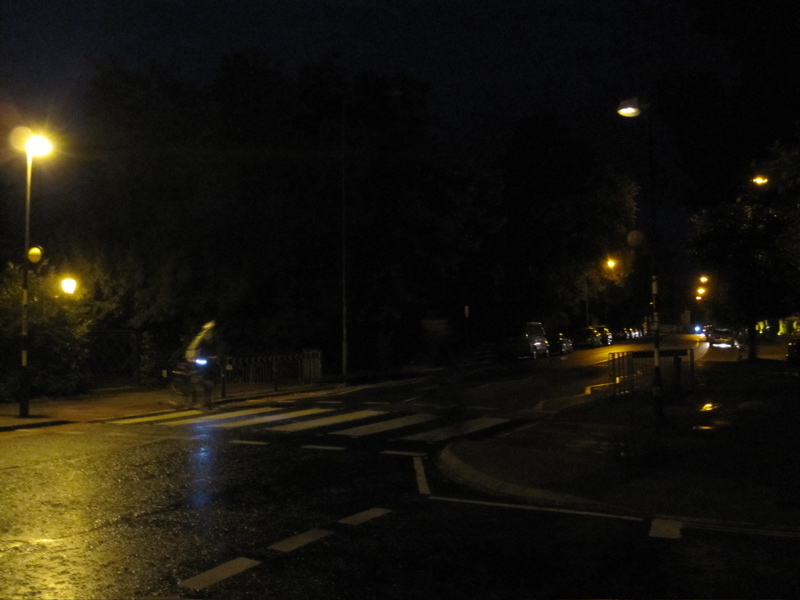 Anyone on the pavement on the dark side of the crossing would be much harder for car drivers to spot under the lighting conditions shown in the second photo, compared to under the conditions shown in the first. I have reported this problem using the FixMyStreet website. This entry was tagged Arbury, Belisha Beacons, Cambridgeshire, Street Lighting, Transport on July 8, 2009 by Richard Taylor. Another streetlight problem I’ve been chasing recently is at the city end of Mill Road. I reported this problem again on the 14th of September. The floodlight was working properly for a period in August but is now broken again. The streetlight has been out for much longer and has never been fixed. I raised this at the North Area Committee on the 12th of November, asking for the general problem of street lights being reported out not getting fixed to be addressed. County Councillor Kevin Wilkins agreed to take the matter up. for the delay and any inconvenience this may have caused. More council incompetence. At 20.45 this evening; the light on the north of the crossing was still flicking between no power, dim power and full brightness. The streetlamp on the south side is still out. After having visited this page and reading the report from the council saying that the light had been fixed, Cllr Rupert Moss-Eccardt went out to walk his dog. Like the previous commenter he also found the streetlight to be still faulty. The lamp is still dim for long periods with short, occasional bursts of full brightness. Light back on at 0:43, out at 1:22. The video appears to have prompted the council to finally fix the light. I spent about five minutes in the area earlier this evening and the light was on throughout. 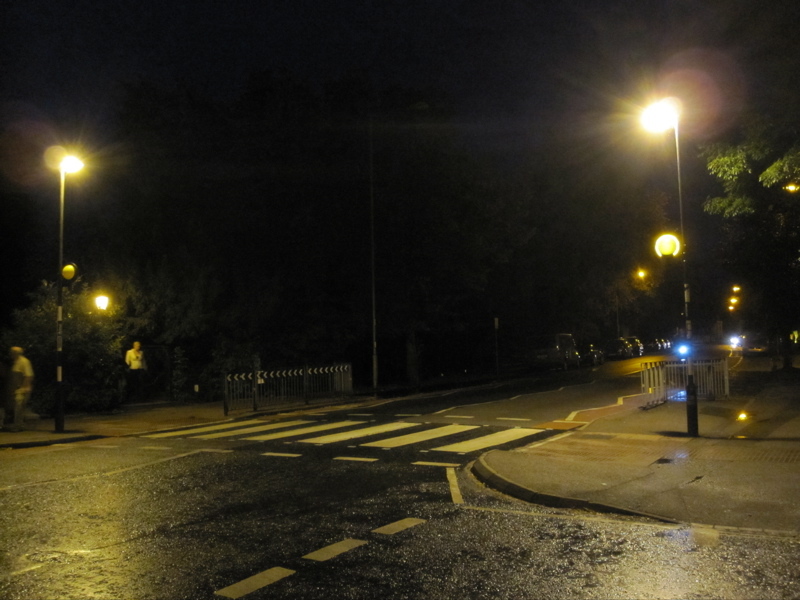 There are still many street-lights out on Chesterton Road, Carlyle Avenue and on Jesus Green on Midsummer Common; but this particularly valuable light is now back on. any further information please do not hesitate to contact me. This is intermittently out again this evening. If you’re particularly impatient; skip to 16 seconds in to see the light go out! I’ve written to Shirley Thwaites of Atkins Global who responds to reports of broken streetlights on behalf of Cambridgeshire County Council letting her know the problem has recurred and sending her a link to this post and the video. Cllrs Wilkins and Moss-Eccardt, and council officers Alan Hitch and Chris Sproston. I have noted that despite the light’s key location it has taken longer than the 7 day average quoted by the council to fix. This is a really important accident blackspot; I came across the aftermath of a minor car vs bike incident there just a week or so ago; I regularly observe, and am involved in, near misses. 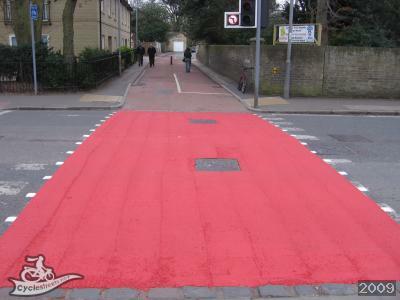 * Deter such heavy use of Chesterton Road; paint it red, cobble it, use pinch points on the entrance from Mitcham’s Corner. * Fly a new cycle bridge over all the way from Jesus Green and land it in the grounds of the Job Centre. *Widen the existing bridge / add a cycle lane to it. Hopefully this is the kind of thing that the new format of North Area Committees will allow discussion of. That zebra has never struck me as a particularly dangerous spot and I have never seen an accident there in 20 years, although I would guess given where you live you use that zebra more than I do. We could do with statistics rather than personal observation, though. Adding a new bridge over the road would be bloody expensive. Widening the existing bridge would seem to have no great bearing on this issue. In fact the current situation where cyclists (are supposed to) dismount ought to make the crossing safer. Are you in such a rush in life that you cannot spare ten extra seconds to admire the river scenery as you walk across? Closing this end of Carlyle Road is about the most plausible option you have given. But again, is this zebra really particularly dangerous? As discussed, can you please arrange for this unit to be repaired today. into this e-mail to confirm that the unit is back in working order. From his email address it can be seen “Darren” works for Atkins Global. I can confirm we have carried out repair to this light today. Clearly there was a problem before the crossing was improved; but it appeared that when the consultation on doing that came out – so did a lot more statistics on injuries than were on the map. The commonly used path of cyclists is unusual and in my view dangerous. Cycling across the zebra crossing is very common – and technically that shouldn’t be done – its often not a safe practice particulary when people emerge on bikes from either the bridge or Carlyle Road and rapidly cross without giving traffic on the road time to stop. Also the volume of people and bikes crossing often, in my experience, results in impatient drivers pushing across the crossing even when people are on it. I’ve crossed half way many times and had a vehicle drive in-front of me. A bridge would be expensive; one was in the Jesus Green lottery bid. A tunnel would probably be impractical on the grounds of the gradients required which wouldn’t be conducive to cycling. Lastly the big difference between this site and Garden Walk to Fisher/Holland Street is the volume of cycle traffic; this is on a national cycle route and a very popular cycle commuter route. The light appears to have been fixed – it didn’t go out while I was under it earlier. Thanks for the link to the accident stats, although it doesn’t explain what it is showing exactly (or even for what dates). It seems to claim that Victoria Avenue has even more accidents than the Jesus Lock zebra, which surprises me. I cycle on Victoria Avenue even more than across Jesus Lock and I find it to be one of the most pleasant roads in Cambridge to cycle along until you hit the Maid’s Causeway roundabout. And again, I have never seen an accident on Victoria Avenue, although I can believe their claim that the roundabout itself has lots of them. I would say that any cyclist that doesn’t dismount across the Jesus Lock zebra deserves what they get (although I’m sure I do that myself now and again). According to some Cambridge cycle route map that I eventually found (http://tinyurl.com/5wr8x5r), the Jesus Lock zebra (and on up Carlyle Road) is not part of a national cycle route. But of course a lot of cyclists (and pedestrians) do cross there. According to that map, I can see that the “official” view is that cyclists should cross Victoria Road at Stretten Avenue. I prefer Garden Walk because (a) it is quicker for me, and (b) I hate the speed bumps on Stretten Avenue. So although my route is more dangerous, I think it is not dangerous enough to make me want to take the alternative. The bridge was one of the few parts of that grandiose lottery bid that made any sense. But for me the number one issue on Jesus Green is the appalling state of some of the pavements. And the city/county seem totally incapable of doing anything or wanting to do anything about that. The city would rather waste money cutting down perfectly healthy trees and then planting other ones (at great expense). The city council keeps making promises on the Jesus Green paths, but there’s been nothing other than some remedial patches done. On the “national cycle route”; I’ve used the wrong term there – your map shows it as part of the “signed primary on road network”; it is a popular and formally marked cycle route: Stretten Avenue -> Searle Street -> Carlyle Road. It is excellent that this is being considered. I hope officers don’t just reach for old plans, which involved using paint to narrow the road for motor vehicles, and consider things like those I’ve suggested above. eg. a clearly marked cycle crossing on the road; perhaps even giving priority to cyclists. I think there’s a need to consider this junction in the context of Jesus Green and the bridge; as well as the length of Chesterton Road. @RTaylorUK @carinaoreilly Thanks for raising this – shall look into it. Cllr @TimWardCam to be petitioned to make Victoria Rd 20mph later http://t.co/PrthWEAyM1 If done; shld do Chesterton Rd/Lane by river too.